WASHINGTON — NASA stands to lose an additional $325 million under the omnibus spending package headed to the U.S. Senate for a final vote. A disaster relief bill the House approved Dec. 16 along with the 2012 Final Consolidated Appropriations Bill (H.R. 2055) includes a 1.83 percent across-the-board cut for all nondefense related discretionary spending, including NASA, the National Oceanic and Atmospheric Administration (NOAA) and a number of other federal agencies previously funded in the so-called minibus spending bill Congress enacted in November. The across-the-board cut, or rescission, is crafted to pay for some $8 billion in disaster relief spending. 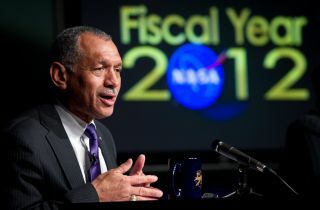 The minibus included $17.8 billion for NASA, or about $650 million less than the agency received for 2011. The rescission would put NASA’s 2012 budget more than $1.2 billion below what the agency requested back in February when President Barack Obama submitted his spending plan to Congress. NOAA, which stood to receive $4.9 billion from the minibus adopted in November, would get only $4.8 billion if the rescission becomes law. The spending agreement the House and Senate reached Dec. 15 was necessary to avert a government shutdown. The federal government has been operating since the new fiscal year began Oct. 1 under a series of stopgap spending measures, the latest of which expires Dec. 16. The House approved the $1 trillion omnibus package the afternoon of Dec. 16 by a vote of 296 to 121. The disaster relief funding and 1.83 percent rescission were approved as seperate measures. The Senate was expected to take up the omnibus later that evening or the next day. It was not immediately clear whether the Senate would also approve the disaster relief package. A summary of the conference report accompanying H.R. 2055 can be read here.